Detailing the physical features, habits, territorial reach and other identifying qualities of the Bicolored Agapostemon Sweat Bee. The Bicolored Agapostemon Sweat Bee has a two-in-one appearance: the shimmering front half looks nothing like its more recognizable backside. Bicolored Agapostemon Sweat Bees are small bees that may sting if disturbed. The head and thorax are a shiny, metallic green color with a bumpy texture. This species has an abdomen that is more commonly seen on bees and wasps. Bands of black and yellow/white on the back half of the insect help observers avoid mistaking it for a fly. 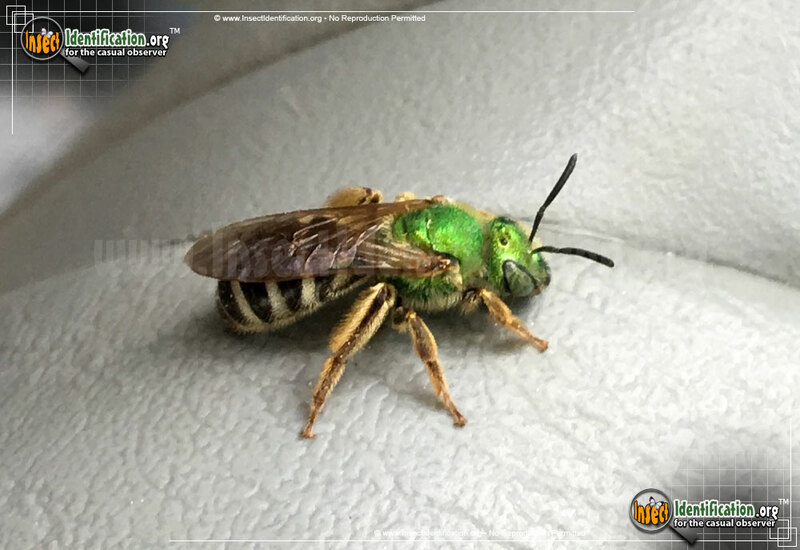 Other types of sweat bees are completely green. Sweat bees get their name from their attraction to human perspiration. Bicolored Agapostemon Sweat Bees queens, daughters and males share the hive with larvae. This species nests in the ground and may damage lawns when building their homes. A small entrance/exit hole may be all that is visible on the surface, but excavation underground to make room for cells can destroy turf roots. The underground tunnels hold capped cells, each containing an egg and its food supply. Flying adults emerge after pupating in their cells. Adults gather pollen and are considered beneficial pollinators. Inhabitants seem to retreat into the nest for hours if something/someone passes by.